A few weeks ago, the country I grew up in made a massive decision about our future – but it feels to me like there’s a heck of a lot that still needs sorting out. I’m obviously talking about the EU referendum. 'Economics’ was a word that was batted back and forth like a swing-ball by politicians and campaigners. “The EU costs the UK economy £350 million a week!”, they said. “Leaving the EU will cause economic catastrophe!” others replied. It seems like virtually no-one trusted claims from either side that they knew best what was good for the economy. What bugged me was nobody really talked about the type of economy they wanted, in or out. Will we keep funding less well-off areas? 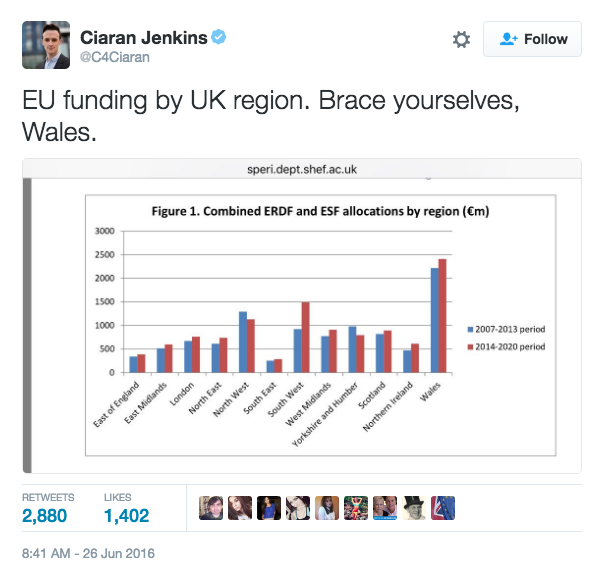 If the UK properly leaves the EU keep I’m quite concerned about what will happen to regional development funding. Right now, a lot of EU spending goes to creating jobs and reducing unemployment in less well-off areas within EU countries. They’re doing everything from financing new businesses to training people and creating jobs. Areas with lower than average incomes and higher than average unemployment tend to get more funding. Maybe this funding didn’t do enough to even up the inequality between regions but unless the UK government commits to funding less well-off areas at at least the same level, I’m worried that the inequality between rich and poor areas of the country is likely to get even worse. 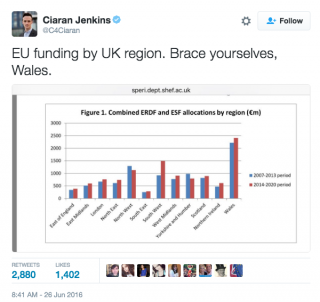 Within the UK, Wales is receives the most EU funding... and it also voted to leave the EU by a big margin, prompting one news correspondent to tweet after the result ‘Brace yourselves Wales’ and attach a bar chart to prove his point. Will rights for employees be reduced? There are a bunch of rights that we get at work as a result of EU laws, like holiday pay and annual leave entitlement. I like going on holiday and so does everyone I know. There’s also a law that stops bosses from making employees work more than 48 hours a week. If you are employed by an agency EU law tries to make sure you don’t get a worse deal than people who are employed directly. Parental leave and maternity pay are also based on EU rules as are rules against discrimination. I’m not saying these will disappear, but some employers may want to use the re-negotiations to get rid of a couple of them because they see them as a burden and they want to save money. Thankfully, it looks like trade unions have started a petition asking MP’s to commit to vote against any reductions in worker’s rights as a result of leaving the EU, so perhaps we’ll be alright. How are we going to keep investment coming in? As far as I can see, the financial market works like a herd of sheep – it’s a big crowd of people who don’t like uncertainty. Because of the lack of clarity over whether Britain would still have access to the European single market or not, Brexit got them all feeling pretty wobbly. All this means is that a group of countries sign up to agree to the same terms of trade with everyone in the group. Usually, countries negotiate trade agreements one-on-one to decide on things like taxes on foreign goods, or limits to imports. If they're in a single market, the same rules apply for everyone – which can be practical, but some say could also limit a country's independence to decide what it trades with whom. Investors could easily decide to pull their money out of the UK if they’re worried the economy won’t grow – which is fine, except if they all decide to do that at the same time, it really won’t grow. It’s like Stephen Kinsella says in the Terry Jones’ documentary Boom Bust Boom: "In economics, you’ve got this strange situation where if enough people think something is a disaster, it really is a disaster." Some action is required to 'restore confidence' but what should this action be? To try and convince them that Britain really is the place to be, former chancellor George Osborne decided to reduce tax on businesses' profits to below 15% by 2020. He hoped to encourage global companies to move their headquarters to Britain and take advantage of this mega-discounted deal – the lowest of any major economy - and that this will reassure worried investors that the UK is in for a boost and then they’ll start investing again. I’m not convinced becoming ‘tax haven-type of economy’ is a very good way of encouraging growth. Plus, it doesn’t seem particularly fair to me that businesses will end up paying a lower rate of tax than ordinary people. What exactly are these 'unnecessary regulations' you'd like us to get rid of? Before his appointment, David Davis wrote an article on a ‘Brexit Economic Strategy for Britain’ where he proposed that the way for Britain to become more productive and export more was to negotiate free-trade deals with non-European trading partners, and to cut 'red tape', specifically 'unnecessary product regulation'. The thing is, I'm not sure what he really means here – is he talking about EU regulations on energy efficiency for household appliances, which yes, led to some high-powered vacuum cleaners being banned a couple of years ago but have also made a significant dent in national energy use? It strikes me that these regulations can also be a way of raising standards – if Britain is to become a high productivity economy, it should probably be exporting quality products that would meet these sorts of standards anyway. Is it so bad if the banks in the City up and leave? A big question on people’s minds is whether the City of London will wave goodbye and move to Frankfurt. It’s a big part of the UK economy and seen as an important source of tax for the country – sometimes it’s called the goose that lays the golden egg. Take a moment to picture that surreal image... then delete it from your brain because the British manufacturing sector actually contributes more than finance does in taxes. Sure, if banks move that’s not ideal for jobs in financial services or the money the government raises from taxes in the immediate term. But I’m not sure having a large finance sector is that great for a national economy. It pushes up prices (think of London property) making it harder for other types of business to get going ('crowding out’). There’s also a danger (as there would be with any big, powerful industry) that the finance sector starts to influence laws and regulations in its own favour. Let’s not forget that the bigger the goose, the bigger the bill that the government has to foot when it goes belly up, like in 2008. So, these are my questions, but what are yours? Now that we’re out, I feel like we need to make sure we’re asking ourselves and politicians the right questions to make sure we build a post-Brexit economy that works for everyone. There’s not always a single choice that’s better, of course – but economics should be a tool to help us work out what we think is important, who gets what, and why. What are the biggest post-Brexit questions for you? Let us know in the comments section, or send your ideas as a pitch to contribute@ecnmy.org!